NEW YORK (CNS) — The latest title to come from publishing giant Electronic Arts and developer BioWare, “Anthem” is a work of art. While the game does involve some combat, the mayhem is not particularly graphic. “Anthem” is thus suitable for adolescent players who, like older gamers, will appreciate its beautiful visuals and intriguing plot. In this online multiplayer action role-playing game, participants take up the mantle of a Freelancer, a powerful warrior who uses special technology and a mechanical suit to defend the human nation of Bastion from outside threats. The game takes its name from a formidable energy source called the Anthem of Creation, which is responsible for most of the terraforming and technology as well as the creatures found in the game’s environment. Someone known only as the Monitor seeks to take control of the Anthem and, with it, the planet. Only the Freelancers can unite together to stop him. The artwork, with its lush landscapes, is breathtaking, and the original soundtrack, composed by Sarah Schachner is equally excellent. The flight mechanics are a thing of beauty and one of the game’s standout features. As Javelin-clad Freelancers soar up towering waterfalls and past gorgeously rendered animals, it truly feels like a setting full of all the amazing details of life. The Freelancer motto is often repeated: “Strong alone, stronger together.” Teamwork is emphasized throughout. In fact, if players don’t form up their own squads with friends, matchmaking creates a team of four for every mission beyond the walls. For all its artistic charm, “Anthem” remains slightly unpolished and has room for improvement. The mission design can become repetitive as players try to thwart the Monitor. 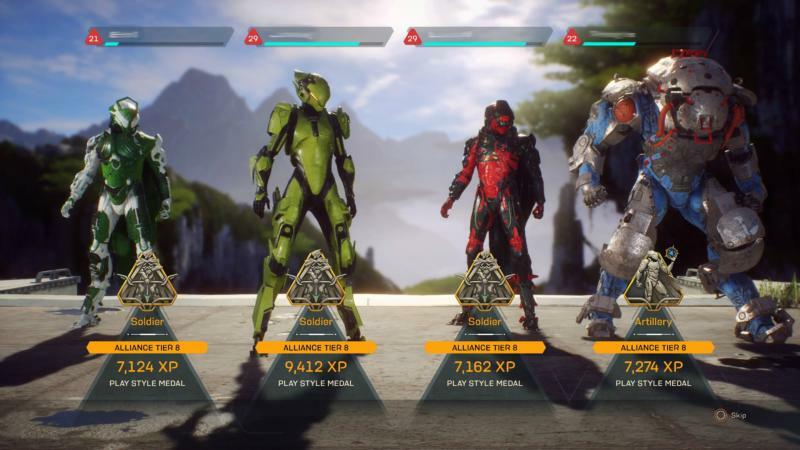 While many enjoy the grind of a good game, “Anthem” repeats the same, tired formula too often. An excessively slow loading screen, for everything from launching a new mission to changing weapon loadouts, is another flaw. Players may feel they’re spending too much time waiting instead of gaming. The race that originally inhabited the planet, known as Shapers, and the Anthem of Creation are both revered within the game as godlike. However, the sci-fi fantasy environment, so far removed from everyday life, makes it unlikely that older kids, at least, will be left with any misimpressions. The primary concern for parents lies in the online multiplayer component, which is unavoidable because an internet connection is required to play the game. Players with microphones have the option of communicating with other gamers over voice chat, potentially exposing them to inappropriate language or misbehavior on the part of squadmates. Playable on Playstation 4, Xbox One, and PC. The game contains much stylized violence, mild blood splatter effects, some coarse language and references to alcohol use. The Catholic News Service classification is A-II — adults and adolescents. The Entertainment Software Rating Board rating is T — teens.